Question: Apart from fixing Michigan roads, what are your top priorities for the 2015-2016 session? Energy reform and increased accessibility. Technology makes it possible for us to harness energy from a variety of sources. We need to work harder to collect, store and make that energy available to our citizens. Greater accountability for education dollars. Children and parents deserve quality schools that graduate students who are ready to achieve their future goals. We all agree that money spent on education is money well spent, but we need to make sure schools are living up to the expectations of parents and students. Low graduation rates and children graduating high school who are not college-ready are not acceptable results from our public education system. It’s time for state government to give back to the taxpayers. As our state begins to turn around, we need to share that success with our citizens by returning their hard earned tax dollars when possible. Economic opportunity and poverty reduction. One of my first bills was HB 4166 (2011) which would have changed unemployment requirements so that Michigan could have received millions of federal dollars to help our jobless families. I introduced SB 1113 (2014) , which helps to put a stop to the “debtors prison” problem, where people who can’t afford to pay their court financial obligations are jailed as a result. Education/workforce development. I introduced HB 4137 (2013), which gives primary care physicians incentive to work in under-served areas by repaying up to $200,000 of their student loans. I introduced SB 839, which increases the number of educational “Promise Zones” in Michigan from 10 to 15. This gives more students the opportunity to go to college for free after high school. I introduced SB 784, which is modeled off Oregon’s “Pay it Forward” plan, where students get to go to college for free and upon graduation paying a portion of their income towards the PIF fund so that other students can go to college. Public safety/crime reduction. Every year I continue to advocate for increased revenue sharing so that communities can have adequate police and fire staffing. My top priorities will depend on two things. The first is what we get done yet this year versus what we have leftover once this session is completed. If there are any good bills or major priorities that just ran out of time, like a solution to road funding, we will take them up again in the New Year. The second is the work being done within our caucus by the Policy Development Workgroup, a special work group tasked with putting together everyone’s interests and ideas for the new legislative session. We are working together as a caucus on putting together our top priorities for the next term and talking about the areas on which we want to focus in order to make Michigan an even better place to live, work and raise a family. We should make life better for Michigan’s families, students and seniors by: (1) restoring funding to our schools, so that our kids can once again get a world-class education here in Michigan; (2) delivering tax relief to hard-working families – who have seen tax increases in the form of reductions to the Homestead Property Tax Credit and Earned Income Tax Credit, the elimination of the $600-per-child credit and the imposition of the new retirement tax on seniors; and (3) empowering Michigan’s small businesses to succeed so that families can find good jobs and start to rebuild their economic security. Question: Do you support repeal of the prevailing wage law? Why? Yes. Prior to my time in the legislature, I was a township official. I saw firsthand the added expense prevailing wage laws had on my community. All things being equal, there is simply no good answer for why it should cost taxpayers more to build a school or a library or a city building simply because we have to pay higher labor costs. A fair and competitive marketplace will produce competitive wages and quality results. We reformed policies at the state level that relied on creative loopholes and incentives that created a culture of picking winners and losers. Eliminating prevailing wage would be one more step in the right direction toward leveling the playing field for everyone doing business in Michigan. I do not. Ensuring good wages for Michigan workers helps our economy and our families. Prevailing wage laws force our state government to overpay hundreds of millions of dollars on state construction projects, taking critical funds away from our schools, roads and other priorities. Powerful special interests have been forcibly taking this money from Michigan’s hard-working taxpayers every year for decades, and it is finally time we stand up for our citizens and put an end to it. By repealing our prevailing wage laws, we can spend more state funding in the classroom instead of on construction costs, and we can put more money in the pocket of Michigan’s taxpayers instead of union lobbyists and other special interests. No. Prevailing wage laws ensure that taxpayer funded construction is done by trained, skilled, and experienced Michigan workers. On projects, such as roads, schools, and bridges, that directly affect the safety and quality of families, children and communities, it is imperative to ensure high construction standards. Moreover, in prevailing wage projects, workers are paid a living wage that allows them to provide for their families and support local businesses. That spending supports even more jobs in their community, creating a ripple effect that improves local economies. Prevailing wage laws are an investment in our state, communities and families, and I strongly support them. Question: Under a constitutional amendment approved by voters in 1992, Michigan legislators are limited to three two-year terms in the state House and two four-year terms in the state Senate. Do you support reform or repeal of term limits? Why? The citizens of Michigan have weighed in on the issue of term limits before and overwhelmingly support a citizen legislature, not a body comprised of lifelong politicians. I would leave it to the voters to decide if we need to revisit the issue of term limits. I don't think term limits have served our state well, so I would be willing to consider reforming or repealing them. However I believe that the priority should be for us to remove any barriers to voting - like allowing no-reason absentee, early voting, and same day registration - before we take on changing term limits or other reforms. I do not support repealing term limits in Michigan altogether. I would, however, consider supporting a reform of our current model. I believe that the people of Michigan would be better served if members were able to serve a little longer than currently allowed. As one who has served four years, I openly admit that I am still getting better and learning how to be more effective. Like any job, becoming an effective legislator takes time. I believe that term limits, in their current form, have weakened the legislative branch of government as they guarantee inexperience. I would have to evaluate any specific proposal on a case by case basis. 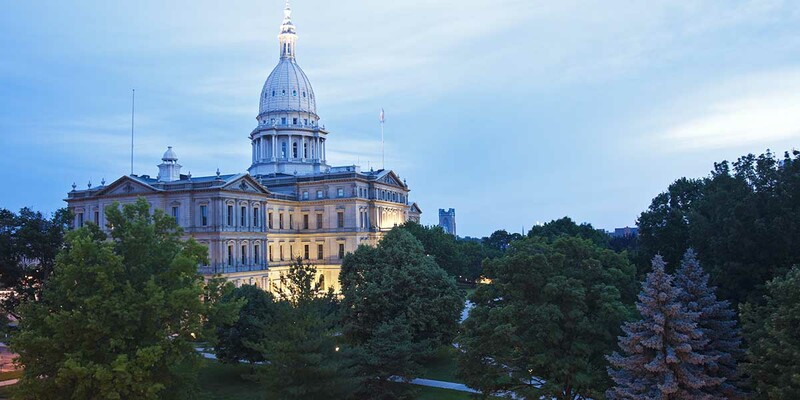 The benefits of term limits have been to bring new perspectives more frequently to the legislature and perhaps to increase the likelihood that legislators relate to the concerns of everyday Michigan residents and families. There are, however, several problems with term limits. First, they eliminate the ability of voters to retain elected officials they believe are doing a good job. Second they reduce the legislative expertise and knowledge that come with longer service resulting in more power and influence for lobbyists, the governor and career bureaucrats. Third, they limit the amount of time legislators have to build relationships and develop trust with one another, which makes bipartisan cooperation more difficult and less likely. Finally, it increases the probability of conflicts of interest with unscrupulous legislators voting in favor of special interest groups in the hope that those interest groups will hire them when they look for a job after being forced out of office. Question: What do you think of Michigan Department of Education Supt. Mike Flanagan’s plan to more closely monitor some charter schools? Any plan that requires greater accountability of our schools is worth considering. I wholeheartedly believe that parents and students need educational choices in order to succeed. We can do better at all levels of education to hold schools accountable for how well they are or are not educating our kids. I think it makes sense to expect adequate transparency and quality performance for our schools. I have always been in favor of higher standards for Michigan’s public schools, and I’m proud of the work we’ve done to make our schools more effective, empower parents and encourage high quality instruction. I look forward to discussing even higher standards and hearing more about new transparency proposals for all of our state’s public schools. I strongly support increasing oversight and accountability of charter schools. Michigan’s education system includes traditional public schools, charter schools, cyber schools and private schools. Any school that receives taxpayer money, as charter schools do, should be held to the same standards of transparency and accountability as traditional public schools. Parents who send their kids to charter schools deserve to know how their taxpayer money is being spent, how school administrators are running their children’s schools, and whether taxpayer dollars are being spent wisely and effectively. House Democrats have introduced a package of bills to address this problem. Question: Do you support a law that would retain third grade students who do not meet proficiency standards in reading? We know that there are too many students moving through our public education system who, for whatever reason, are not performing as well as their peers. The earlier that educators can intervene to address a student who has fallen behind, the better off that student will be in the long run. That being said, we also need to be sure that there are considerations for students with special needs and that parents and teachers are part of the long-term plan to help meet the student’s educational goals. A ‘one size fits all” model is not necessarily the answer. We need to figure out a more comprehensive approach to ensure our students are being properly educated and are prepared to enter the workforce upon graduation. I don't support this legislation in its current form because I don't believe it would achieve the broader goals we should be striving for in all our classrooms. Those bills are still making their way through the Legislature and could still see several changes. I will be happy to take a look at them once a final version is presented. Literacy is absolutely essential for economic success, and it is imperative for kids to learn to read at a young age. We must ensure that all schools implement proven intervention strategies to help all children to reach grade-level proficiency. Rather than mandating that children who cannot proficiently read be retained for an entire academic year in all subjects, it would be far more effective to provide tutors for struggling children, to retain children for intensive reading instruction over the summer, and/or to retain children at the previous grade level for reading instruction only, instead of in subjects that a student may be excelling in. Question: Can you name one area where bipartisan cooperation is possible to improve Michigan? Most of the legislation that passes the senate passes with bipartisan support, but that’s not what makes the news. I think we have already seen many instances where bipartisan cooperation is necessary to improve Michigan. A recent example of that cooperation is in the area of road funding. While we don’t have a final plan for how to fund and fix our roads, I guarantee it will not happen without support from both sides of the aisle. I think there are going to be a lot of opportunities to work together in the areas of talent and workforce development, as the Governor has outlined these as some of his top priorities in 2015. I look forward to working across the aisle to ensure that we are doing all that we can so that our residents all have access to opportunities and a pathway to good jobs. I think we can expect bipartisan cooperation on several of Michigan’s biggest issues, just like we have seen on many top issues over the past few years. Our education bills, tax overhauls and regulatory reforms have often seen legislators from both parties working together and final products that have earned strong, bipartisan support. Democrats and Republicans have come together to vote for these reforms because they were the right moves at the right time to kickstart Michigan’s comeback. I expect this will continue as we move forward next term. We’ve seen in the past few years how bipartisan efforts have benefited Michigan. Support on both sides of the aisle was necessary this legislative term to pass the Healthy Michigan expansion of Medicaid coverage, to increase the minimum wage, and to provide the assistance and reforms necessary to get the city of Detroit back on its feet. Other opportunities for bipartisan cooperation include establishing uniform criteria for evaluating public educators, establishing Common Core education standards, and increasing funding for transportation. I look forward to a coalition of moderates to address the remaining economic issues of our state. That would require reasonable people out of both parties, probably leaving the extreme members of both parties out of the loop. 'Moderates' - there aren't any in the Michigan GOP. Former governor Romney would have been 'fired' by today's Michigan GOP. And Ronald Reagan. Much talk with little promise of fixing the roads and properly funding K12 education. Mention the word tax our politicians become catatonic or rage about current tax rates. Taxes are what fix roads and educate our children. No taxes and the roads become impassible and a good education of our children will be for those who can afford it. It is time to change the Constitution and create a progressive Income Tax and close the Loopholes in the 6% business tax and increase the rate to 10%. This will fix the future shortfalls in the general fund, Next on the list is to remove the sales tax on gasoline and raise the gasoline tax to $0.33 per gallon. Without adequate taxes Michigan will need an Emergency Manager in the near future. I would not like Michigan to be the first State to declare Chapter 9. More of the same GOP hypocrisy! That is the problem for Michigan residents and those who pay taxes. No legislation of merit will be passed in Michigan unless approved by national GOP Pacs! Tax cuts for business's didn't create those promised "middle class jobs"! Eliminating the prevailing wage would further reduce the middle class!! Accountability for education dollars didn't apply to the "billion dollars" of taxpayers dollars to charter schools. Right To Work was to undermine a workers say in their work place and to restrict political dollars of workers. This state would be better off with no defined political parties for state offices and absolute transparency in any funding of politicians or issues. "fair and competitive" wages--contradictory terms. My child's father worked, with a bunch of them, as computer programmers assigned to the same big corporation by whichever contractor won the bid. The last one won it by paying no insurances and not even sick leave much less vacation. (He was made to make up the--unpaid--time he missed for his mother's funeral.) So MiChild--Michigan's program for coverage for children of low-income families--covered her. Thank you, co-taxpayers. All white males? We don't have a single female to interview, just for a different idea? Let's face it, Republicans are not the majority party in the Michigan House of (non)Representatives. Collectively, they got only 42.7 percent of the vote.